The exploding demand for inside sales leaders means that top reps are being promoted even if they are unprepared for management. Despite their expertise with traditional techniques, many don’t "get" the new world of Sales 2.0. They don’t know how to train their teams in social selling, digital communications, and disruptive content creation, skills that are absolutely vital in today’s sales environment. The pressure to produce can be crushing, but the guidance provided has been minimal…until now. Smart Sales Manager shows readers how they can lead their inside sales squads to success — from hiring and motivating to training, coaching, and more. The characteristics of the new independent buyer: Customer 2.0. How to shape Millennial employees into disruptive inside sales superheroes. 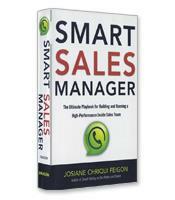 The secret for hiring inside sales talent that forms the building blocks of your organization. The Metrics 2.0 method for improved measurement of sales activities.